Today is trash day and I’m reminded of my youth and the joy of riding my bike. Yet for a little girl somewhere, her bike will no longer give her hours of exhilarating delight, riding it to school, to the park and to places only the wings of her imagination can find. Perhaps she outgrew this bike. Maybe she rode it into the ground. Who knows? For the bike does not speak. The bike shares not the little child’s secrets. Why, indeed. All good things must come to an end, wee one. For now, the bike is headed to its final resting place. Let’s hope it had a chance to say its proper goodbyes. RIP, sweet bike. You served your mistress well, I’ve no doubt of that. One day, when she is grown with children of her own, she will remember the fun times and the happiness you brought her for a little while in her state of wonder, that which we call, youth. Note: I’m taking part in NaBloPoMo. Thirty days, 30 posts. EXCITING NEWS! I ate a pickle and it was sour! Don’t forget, I’m awarding a prize to one lucky reader–the one person who has commented on the most posts this month. If there’s a tie, I’ll do a drawing. So, thanks for adding your two cents! How do you send a pretty pink bike to a final resting place, oh sad. I am so very certain some father or mother could polish it up for a new child. Sour? You could have tried a Sweet! I thought it was a sweet one and turned out sour. What a surprise! O, it looks as though that pink bike may have a few more years to live, Monica!! They must be getting her a new one for Christmas!! Kim, I’m hoping there was something severely wrong and unfixable about that bike and that’s why they put it with the trash. But you’re right, the little girl is probably getting a new, slightly bigger one for Christmas. Sweet! Brought memories of my girls bikes, Monica. Only thing was they were never pink. We always got bikes from our friends who have boys. They barely rode them, then outgrew them, so we ended up with a green monster bike and a blue Spider-man bike. When my girls outgrow theirs, we recycle them. They always have a special memory attached to each bike. I know you like to ride, are you still able to? I haven’t yet found the courage to get back on one since I fell as a child. It is on my list of things to try again. MM, you must get back on that bike and try again. I fell off my bike once long ago and ended up with some scrapes, bruises and a chipped tooth. Never for a moment did I fear going back on it. That bike took me to so many places. It’s a joy, a thrill to ride. So, MM, please try again and remember the example you want to set for your own girls. I mean that with all sincerity. I really ought to, you’re right, for the girls too. They go on long rides with my husband and I never do.. they always ask me to try again and fear holds me back. So I’m looking upon it as a challenge… fingers crossed. I’m rooting for you, MM! You can do it! Then you can blog about it, okay? Nice tribute or obituary to Bike. I remember my little green one. I’d ride it to work if I still had it. To the grocery store with a basket and all too. I know I’d stand out and all but looking at that bike brings on my sentimental side and whatnot. Thanks, Tots. I didn’t learn how to ride a bike until we left Queens and moved to the suburbs. I was 11 and very ashamed to be learning so late. Neither of my parents rode, so they couldn’t teach me. I had to wait for my brother to teach me and he did, with great patience one afternoon. I’ll never forget that moment when he let go and I kept riding down the block. I’d gotten the hang of it! My parents then proceeded to get me a bike of my own and it was purple. Beautiful, shiny purple. What memories! Actually, when my daughter was first ready for a two wheeler, my husband found one just like this in someone else’s “big garbage” pile. We took it home, fixed it up and voila–good as new! I hope this bike gets a second life of its own. Wouldn’t that be nice? To have it go to another child, whose turn it is to learn how to ride a bike? I’d like to think so. Fingers crossed! Poor little lonesome bike! Sad that we have to outgrow the toys and things of our youth, isn’t it? 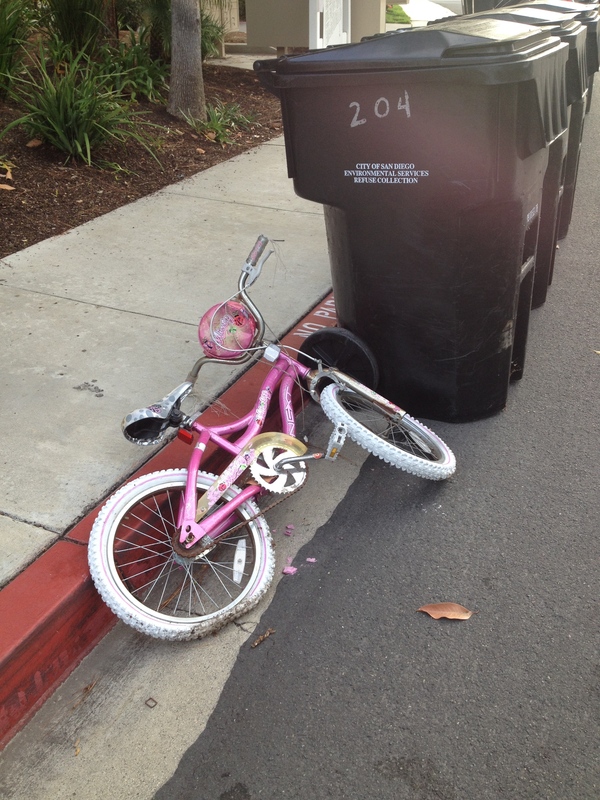 I had a pink bicycle, too, but I don’t remember setting it out with the trash containers. Ironically, Debbie, the trash collectors won’t take anything that’s not inside the container. Was it really not salvageable at all? I really hope Santa brings her a fabulous new big girl bike! Wouldn’t it be cool to have a leopard or tiger-print bike? Don’t know why they don’t make them that way. Short of that, purple or red would be nice. Or orange like mine. What’s your favorite color for a bike? It would be very cool to get an animal print bike. I think I’d like purple. It’s been so long I’m not sure I’d know what to do if I had one! Ask a friend for a refresher, though riding a bike is something you never forget. Like walking! If you will excuse the pun you could always recycle it!! It’s amazing what people throw away sometimes. I still remember my first bike, it was a three wheeler, I doubt if I could fit on it now!!! Absolutely! Seem so callous to just toss it to the curb, with nary a proper send-off! Oh no! No bike should come to its final resting place. Like Andy in Toy Story, there are generations more to meet. There is a child, at least one little girl…or boy…who would love to have that pink bike with the white tires, cool decal and cute “thingy” on the handlebars. Toy Story is one of my favorite all-time animated films. Especially that last one when Andy gives up his toys and goes to college. I saw that film with both my grown kids and there wasn’t a dry eye among us! Yes, it made me sad to see the bike come to such a lowly end. Too bad it couldn’t be passed on to someone else. Sigh.